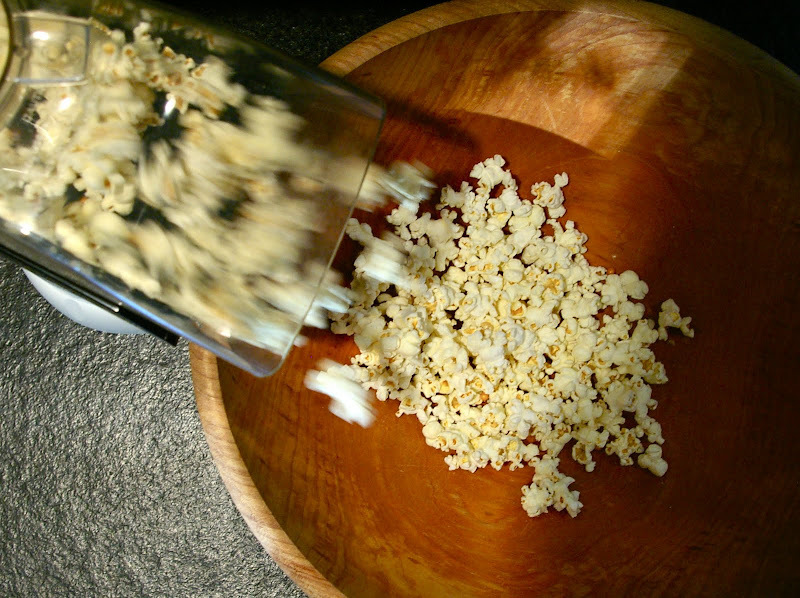 Growing up, popcorn was always the go-to snack at home. We'd have it after school, watching tv at night (Love Boat, Happy Days, Mork & Mindy...), sometimes even for dinner! Always in the same green bowl. Usually with a dog nearby, attentively and patiently waiting to catch a tossed or dropped kernel. Back then, in the dark ages, we would make it on the stove. Then we moved on to air-poppers, and special contraptions for popping kernels in the microwave. At my house, we have gone back to stovetop methods with a crank-handle kettle, which is fun. But for ultimate ease, and letting kids help themselves, the air-popper is the way to go. I don't do microwave bags of popcorn. But I do butter. Always plenty of butter. What a great list of shows. That was totally my list of permitted family-TV viewing when I was growing up, although the Love Boat could sometimes be a little too racy. Did you forget Fantasy Island? And your oh-so-favorite Carmine on Laverne and Shirley? We always did the popping of corn in a pan on the stove. To get a little "crazy", once in a blue moon, my parents would splurge for that Jiffy Pop, which was still cooked on the stove but it was in it's own little aluminum foil-covered pan. Now that was living. Ok, well... so, I probably was watching Love Boat while the parents were out for the evening...same with Fantasy Island. Of course Laverne & Shirley!!! How could I forget? And Jiffy Pop! Only very occasionally... about as often as we had Fruity Pebbles.